Selected from over 200 local companies nominated in St. Louis, Missouri, IQComputing has been named a Best Web Firm in 2014 for our excellence in custom website design and development in the January 1st issue of the St. Louis Small Business Monthly. 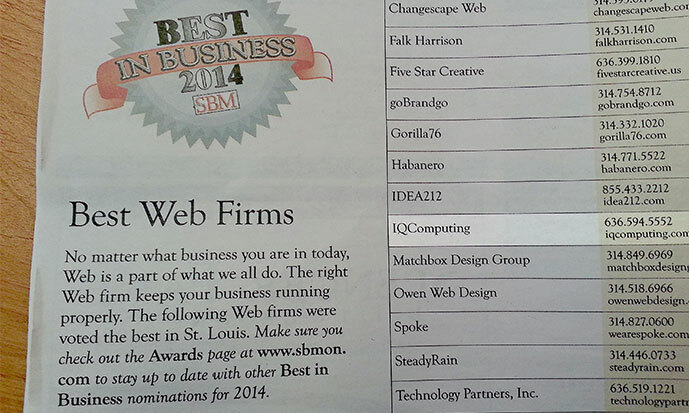 The category is designed to exhibit the best in the area of a given industry and IQComputing received the award again! Making the ‘best-in’ list five years in a row, IQComputing continually strives to give our clients results at a great value, supporting this nomination as the best web design firm in St Louis. Readers of the print/web publication are polled to develop the list and winners are sorted alphabetically. View the complete list of 2014’s Best Web Firms from St. Louis Small Business Monthly.